Five-time All-Star Russell Westbrook will become a free agent following the 2016-17 NBA season. AFTER KEVIN DURANT opted to join the Golden State Warriors, the Oklahoma City Thunder are not expected to be out of the limelight anytime soon as NBA All-Star guard Russell Westbrook enters the final year of his contract. Free agent Durant decided to part ways with the Thunder yesterday, taking up an offer to link up with Western Conference rivals the Warriors. Attention now turns to Westbrook, who is set to become a free agent following the 2016-17 season. The Thunder are reportedly weighing up whether to cash in on five-time All-Star Westbrook, should he not agree to a new deal in Oklahoma City. Thunder general manager Sam Presti has a history of cashing on prized assets, having traded James Harden to the Houston Rockets in 2012. “I don’t have my head in the sand. I understand all the speculation and things that make the internet go around. I think this is what Adam Silver had in mind when he said 2016 free agency was going to blow up Facebook. He was kind of a prophet with that. But I would say that anything like that with Russell is hypothetical. Everybody knows how we feel about Russell. 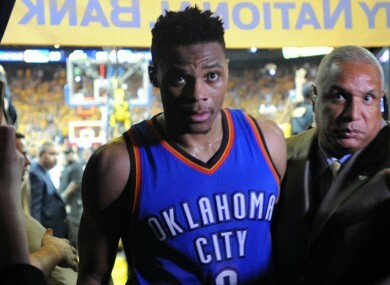 At this point in time, the Thunder are determined to rebuild around Westbrook, who helped the franchise force a game seven against the Warriors in the Western Conference Finals. “Russell Westbrook is a force of nature. He is a true leader in the sense that he takes it on. He takes it on, and I think he’ll take this on, as well,” Presti added. “He has helped establish the standards that we work by, as have Kevin and the other players that have come before us. Email “OKC look to build around Westbrook, but can't rule out trade after Durant exit”. Feedback on “OKC look to build around Westbrook, but can't rule out trade after Durant exit”.